I had my radio locked on 104.5 this morning because I knew that Skip and the crew were scheduled to speak to their audience about the station's decision to fire Nanette Lee and Wig. Murphy called the segment Real Talk, and in teasers leading up to the discussion he promised to get the real story out on what really happened. One of the reasons Mr. Murphy offered for the need to make the info public was negative phone calls, emails, and letters regarding new cast members Lady Jade and MoZan. He said that many of the communications accused him of "bending the truth" in regards to why Nanette was let go. Skip said that his intent was not to mislead the public, but to keep from having to trash Nanette on the air. Skip and the rest of the show then proceeded to trash Nanette and Wig for the better part of the next 25 minutes. As far as Ms. Lee goes, the reasons offered for her dismissal were failure to follow the "plans and policies" of the station. They went on to add that Ms. Lee was "constantly late and unprepared," even a day after a meeting discussing her tardiness. I wonder how KKDA's HR department felt about the terms of Ms. Lee's termination being broadcast over the airwaves? According to this mornings account, the members of the show voted to remove Ms. Lee after this final incident. As for Wig, he was reportedly fired for failure to adapt to the stations "Hip-Hop" format. As the show's producer, Wig was in charge of spinning the tracks, and his selections went against what the station wanted. "If the boss wants hip-hop, you've go to do what they tell you," someone chimed in. The station is apparently targeting 18-24 year olds, which seems like a strange direction for the A.M. This morning's show had tone of someone who is afraid of Mr. Charlie. Since I don't listen, I couldn't tell Fly Ty from Junebug, from T-Mac, but I was halfway expecting one of the dudes to say "he pay us this good money, he give us this good job, you bet not sass Mr. Charile," and I guess they did say it in so many words. "If they pay you a million dollars, why wouldn't you do what they tell you?" In the end, Skip told the audience not to feel sorry for Nanette because she was still getting hers. Sam Putney asked the audience to stop blaming Lady Jade, MoZan, and the rest of the crew because none of this is their fault. They then asked their listeners to accept the "new family" because they were family for life, regardless of who is sitting in the seats. The show has been billed for all these many years as a family, and in the end you can pick your friends but you can't pick your family. The K104 family has loved on Skip, Sam, Chris, Nanette, Wig, and Throwdown for all these years to the nth degree. What would make anyone think that they wouldn't have a little hate to spew when the family breaks up, regardless of who's fault it is. Sending threatening letters to the new crew is extreme, but I would expect nothing less than loyal listeners to voice their displeasure with the turn the show has taken. It's up to the station and it's executives to manage the fallout, not Ms. Lee. How many times have we heard promos over the year of listeners voicing how much they loved the family and how much the Morning Team has meant to their lives? It's a shame that the principles of the show chose to handle "Real Talk" in such a way this morning. If their purpose was to defend Jade and Mozan, then it could have happened without bad mouthing Nanette and Wig, it just wasn't right. I'm not even sure of the legality of such behavior. Yeah everyone should move on, but ain't no drama like family drama cause family drama don't stop. Next story Does knocking down trees and filling creeks equal pro-enviroment? Antoinette Brooks: The 1st African American as President Means…..
Eric Holder Barack Obama’s Pick for Attorney General? Even now K104 is still not the same. The show is weak and boring. For sometime now I drive to work with my radio off. Now one morning shows are good not K-104, Rickey Smiley,or Steve Harvey. 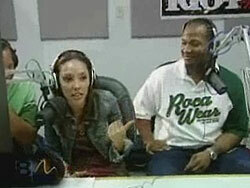 SWITCHED TO RICKY SMILEY AFTER THIS HAPPENED !! !